Ice cream is everyone’s favorite summer sweet treat. 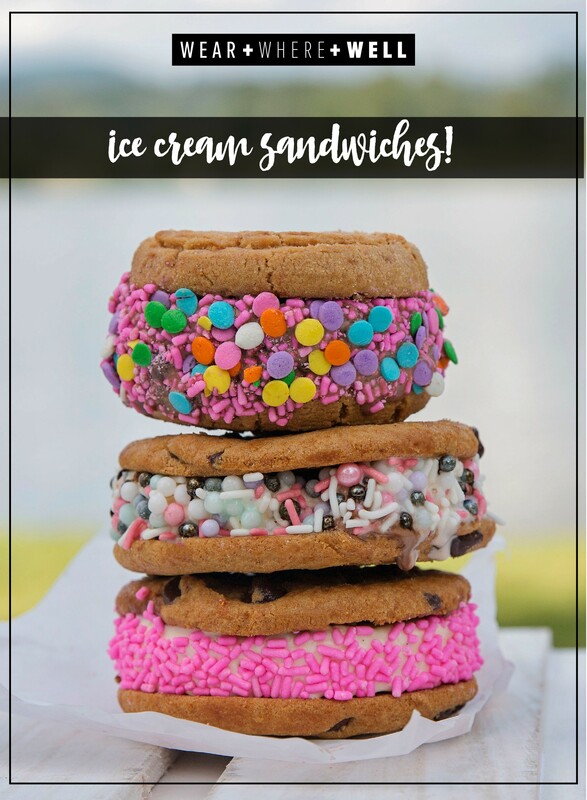 Did you see our Houston Ice Cream Guide that went up earlier this week? It’s every bit as beautiful and delicious as you can imagine. 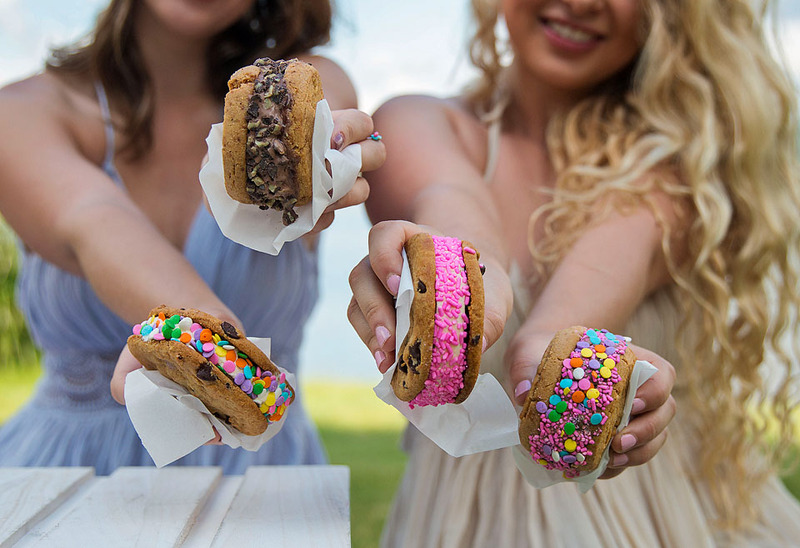 We especially love ice cream sandwiches because what’s better than ice cream? Ice cream with cookies, of course! 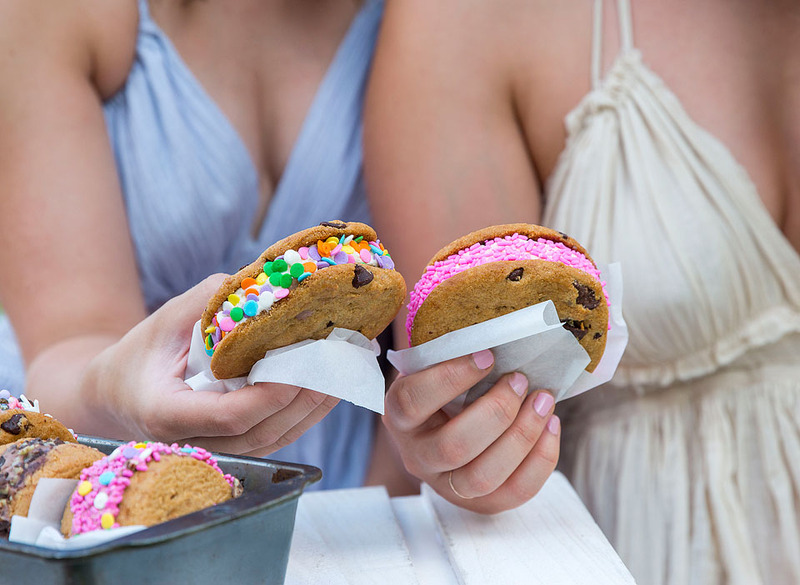 And making them at home means you can layer your choice of ice cream between two of your favorite cookies to create an unbeatable combination. These sweet treats are the perfect way to cool off on those warm evenings. 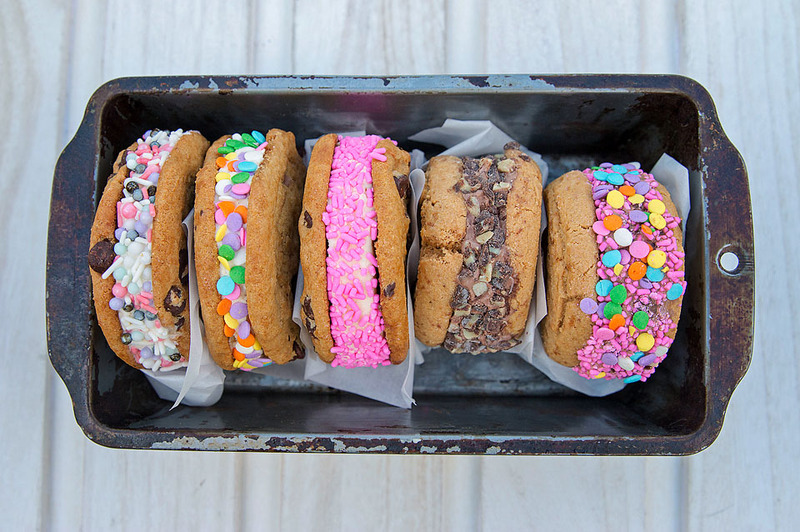 Adding colorful sprinkles or candy bits will make these frozen sandwiches hard to resist. For serving, cut a piece of parchment paper to wrap the cookies in. 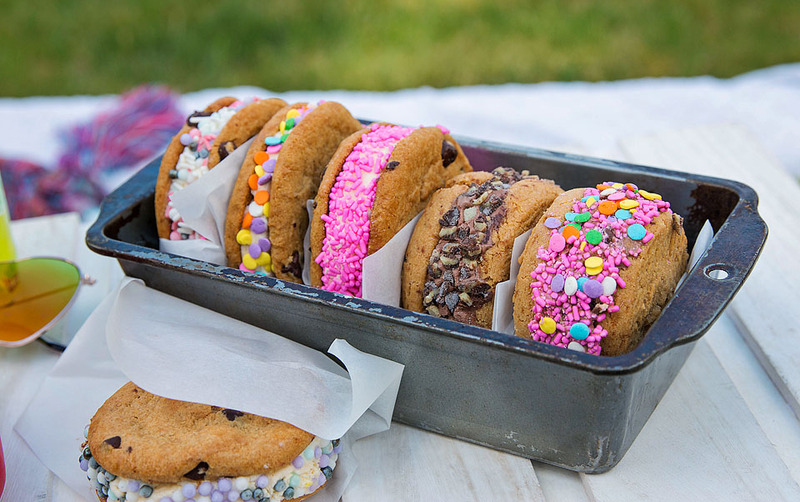 If making your own cookies and ice cream sounds like too much trouble, you can simply use store bought ice cream and bakery cookies for a dessert that is quick and easy to pull together. 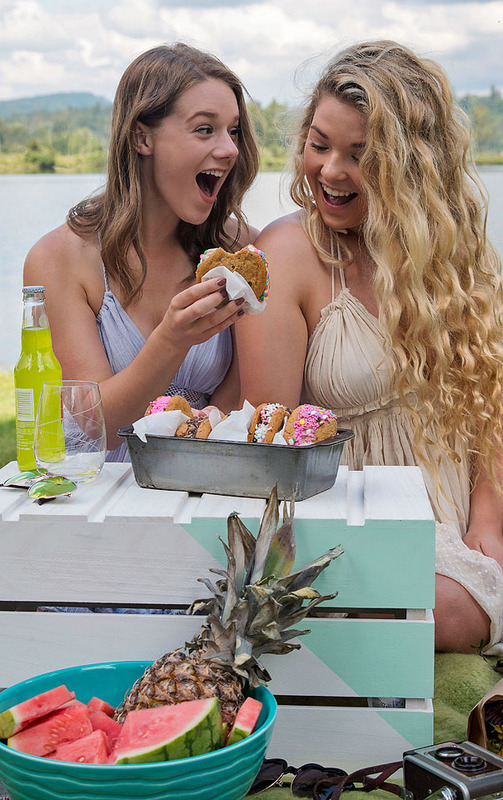 Pictured in the photo are peanut butter cookies with chocolate ice cream, which tastes so good together. With a mixer, beat the whipping cream until it forms peaks. Add icing, sugar and vanilla. Mix on low until just combined. Place in a freezer safe container and freeze several hours. Preheat oven to 375 degrees F. Prepare a baking sheet with parchment paper. Set aside. In a bowl, mix flour, baking soda, and baking powder. Set aside. In a mixer with a paddle attachment cream together butter and sugars. Add vanilla and eggs one at a time. Mix to incorporate. On low speed, slowly add the dry ingredients and mix just to combine. Refrigerate dough for 30 to 60 minutes. This is important so they don’t go thin while baking. Put equal sized scoops of batter onto the baking sheet. This is important to make sure cookies are an even size. Bake for 11 to 12 minutes until slightly golden. Cool on rack. Scoop about a 1/2 cup of softened ice cream onto parchment paper. Flatten to about 1” thick using the bottom of a glass. Repeat to create the ice cream filling for the number of sandwiches you want to have. Place baking sheet in freezer for 1 hour. A deep freezer works better than the freezer in your refrigerator (if available). Using a large round cookie cutter (the same size as your cookies), cut the frozen rounds of ice cream and then place the round between two cookies. 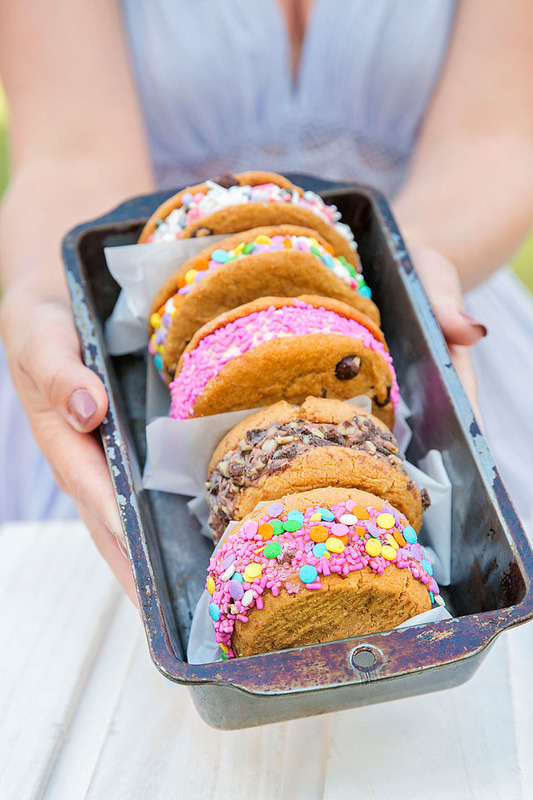 Place sprinkles or candy crumbles in a plate and roll sandwich edge to embellish. Place in freezer until ready to serve. A deep freezer works better than the freezer in your refrigerator (if available). 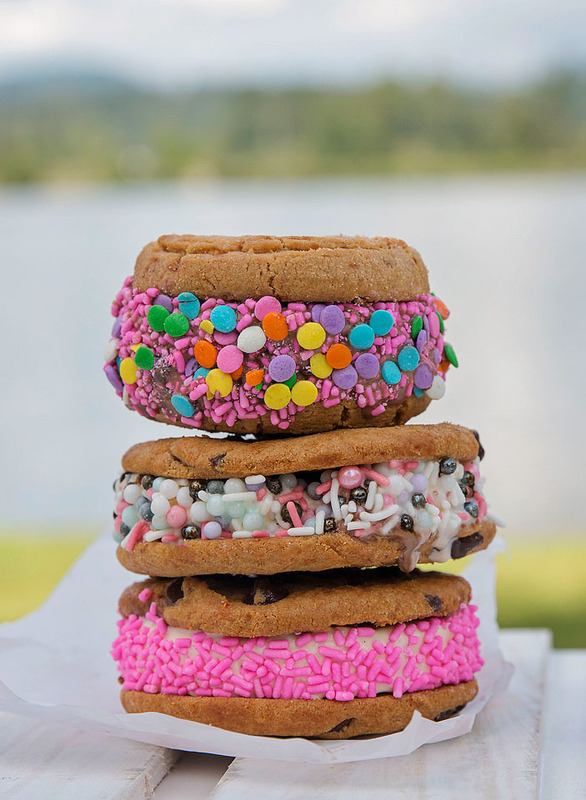 What’s your favorite ice cream and cookie combination? You definitely should try these! And if you do, please let us know what you think. Hope you’re having a great start to your summer!